Unemployment was up in 44 States, down in two states, down in D.C, and unchanged in four others. There has been no improvement nationally this year. The jobless rate climbed in 44 U.S. states in July, showing last month’s increase in unemployment was broad based. Alabama and Alaska registered the worst performance, with joblessness advancing by 0.5 percentage point in each, figures from the Labor Department showed today in Washington. Payrolls grew in 31 states last month, led by California and Michigan. Unemployment jumped to 8.3 percent in Alabama from 7.8 percent in June, and climbed to 7.7 percent in Alaska from 7.2 percent, today’s report showed. Nevada, where the rate rose to 12 percent from 11.6 percent, remained the state with the highest level of joblessness in the country. Rhode Island, at 10.8 percent, was second, followed by California at 10.7 percent. North Dakota had the lowest unemployment rate in the nation, even as it rose to 3 percent from 2.9 percent the prior month. Two states, Idaho and Rhode Island, showed a drop in their unemployment rates. Joblessness was unchanged in four states. Unemployment in New York rose to 9.1 percent, the highest since 1983, and payrolls dropped by 3,700 workers. The jobless rate has exceeded 8 percent for 42 consecutive months, the longest stretch in the post-World War II era. The New York statistics above tie in nicely with what I said early this morning in New Jersey Unemployment Hits 35-Year High of 9.8%. Note that three years into an alleged recovery, the unemployment is still higher than the peaks in 8 of the last 10 recessions. 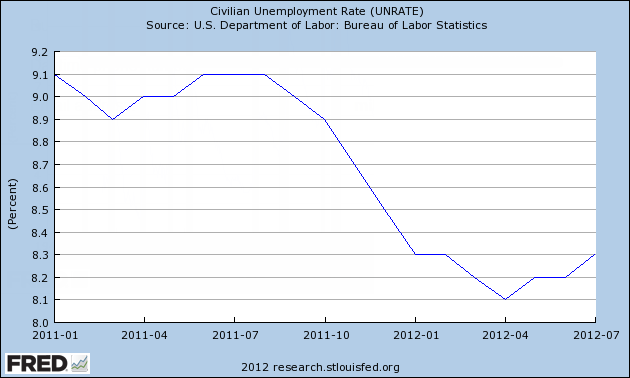 There has been no improvement in the unemployment rate in 2012. Please remember the reported headline jobs number has no bearing on the unemployment rate. Rather the unemployment rate is determined by a phone survey. That’s why its important to dig into the reported monthly jobs numbers. In the last year, the civilian population rose by 3,683,000. Yet the labor force only rose by 1,655,000. This month the Civilian Labor Force fell by 150,000. This month, those “not” in the labor force increased by 348,000 to 88,340,000, another record high. If you are not in the labor force, you are not counted as unemployed. In the last year, those “not” in the labor force rose by 2,027,000. Over the course of the last year, the number of people employed rose by 2,770,000. Participation Rate was steady at 63.8%. Long-Term unemployment (27 weeks and over) was 5.185 million a decline of 185,000. Over the past several years people have dropped out of the labor force at an astounding, almost unbelievable rate, holding the unemployment rate artificially low. Some of this was due to major revisions last month on account of the 2010 census finally factored in. However, most of it is simply economic weakness. The key point above is those “not” in the labor force rose by over 2 million. In the past several years, millions of citizens want a job and need a job but have not looked for a job by strict BLS accounting. Searching for jobs in the want-ads or on Monster does not count. One needs to actually apply, have an interview, or send out resumes. People are going back to school in staggering numbers and young adults are staying in school longer because there are no jobs. Please recall my post 53% of New Graduates are Jobless or Underemployed; Rude Awakening for Class of 2012; Useless Degrees; Who Benefits From Student Aid? In my article Question on Jobs: How Many Does It Take to Keep Up With Demographics? I noted that “Middle-Aged Borrowers Pile on Student Debt“. Well, if you are in school, you are not in the labor force. Disability Fraud is on the rise. I have written about it many times as that link shows. As related to unemployment, the key report is 2.2 Million Go On Disability Since Mid-2010; Fraud Explains Falling Unemployment Rate. 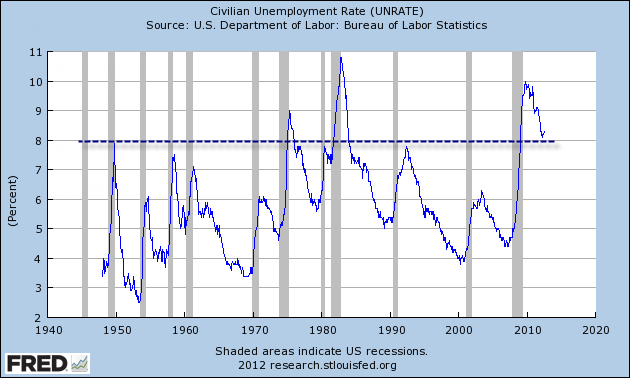 Not only is the unemployment rate artificially low, but it is no longer falling. And since it has stalled, we had three anemic retail sales reports followed by a reported rise last month.